PARIS (Reuters) – France will take Google and Apple to court over contractual terms imposed by the tech giants on startups and developers, said Finance Minister Bruno Le Maire. 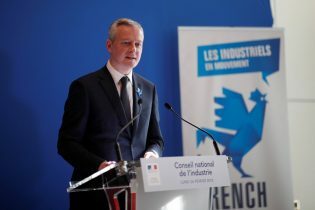 Speaking on RTL radio, Le Maire said on Wednesday he had become aware that Alphabet Inc.’s Google and Apple Inc. unilaterally imposed prices and other contractual terms on software developers. Spokespeople for Apple France and Google France did not immediately respond to calls and messages from Reuters seeking comment. Le Maire also said he expected the European Union to close tax loopholes that benefit Google, Apple, Facebook and Amazon by the start of 2019. Brussels is currently examining measures to improve the taxation of overseas tech giants’ online business in European markets.